Success! Trader Joe’s Will Cut 1 Million Pounds of Plastic From Its Stores! We’ve been told individual recycling can fix this problem, but the reality is that only 9% of plastic is recycled. Instead, plastic producers have to cut plastic pollution off at the source. That includes stopping unnecessary plastic used to package the goods we buy every day. Supermarkets are where we confront the worst plastic packaging. We are sold fruit, vegetables, snacks, shampoo, and soap packaged in plastic that we have no choice but to throw away. 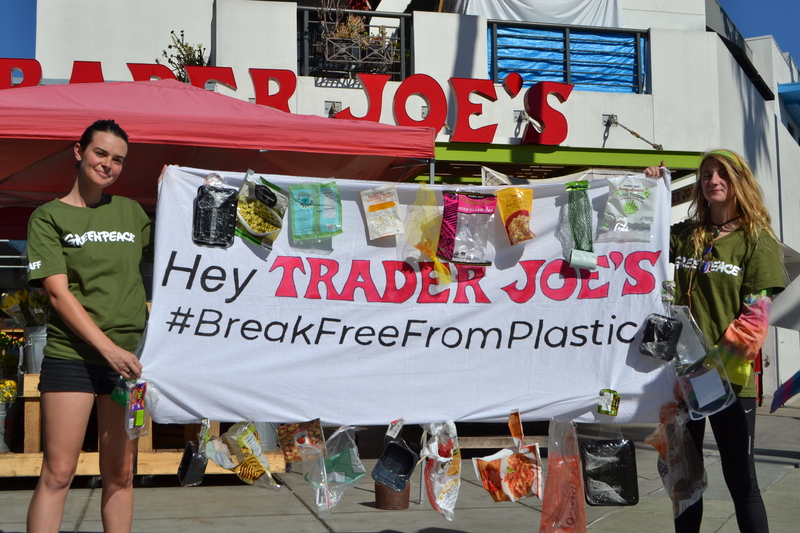 Greenpeace activists in LA dropped by @traderjoes to say it’s time to #BreakFreeFromPlastic! Have you shared your #PointlessPlastic yet? This announcement from Trader Joe’s is a step in the right direction — the retailer has committed to stop offering single-use carryout bags nationwide, replace its produce bags with biodegradable and compostable options, replace Styrofoam trays used in packaging, and sell more loose produce rather than wrapping it in plastic. But Trader Joe’s doesn’t go nearly far enough. There’s plenty more plastic — way more than 1 million pounds — that Trader Joe’s needs to remove from its stores. We all need to hold them accountable to this pledge and make it clear there is always room for more to be done. Let’s make 2019 the year we ditch #PointlessPlastic for good! 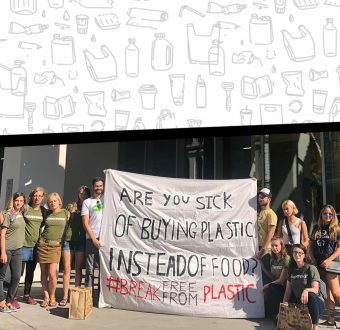 Leave a comment below to tell @traderjoes how you want them to #BreakFreeFromPlastic this year! We’ll make sure Trader Joe’s sees your best comments. Every step of the way, supporters like you have been with us in this historic campaign to transform our throwaway culture and create a sustainable future. 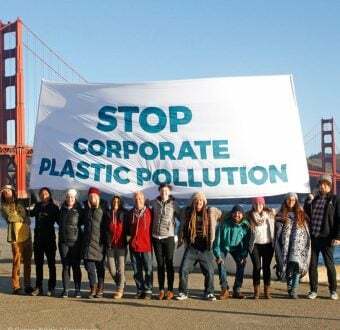 Already, over 140,000 of you have signed petitions to supermarkets; hundreds of you recently joined us in a conference call to learn more about how to combat plastic pollution; dozens of you hosted movie screenings; and, over 250 of you conducted surveys of single-use plastic at Trader Joe’s and other supermarkets. Thank you for everything that you’ve done and continue to do! Together, we’re making history. Let’s to keep up the pressure and tell plastic polluters to #BreakFreeFromPlastic! Kaitlin Grable is the Social Media Associate for Greenpeace USA. 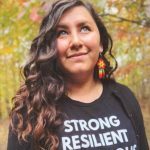 She is currently based out of Durham, North Carolina on Catawba territory. You can peep her on Instagram @AroundTheWorldInKatyDays.